IgniMagnus: Black Lives Matter making a point. We have seen the rise of many groups that don't have a singular leader that started it guides it. These are organizations like Anonymous and Black Lives matter. When there are so many different groups all fighting to be heard and to be seen sometimes they collide. 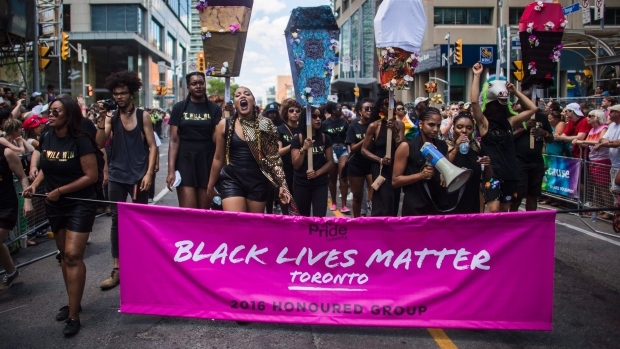 When the Pride Parade was in Toronto they got held up by a Black Lives Matter group. There isn't freedom achieved for everybody yet. “Folks are forgetting that we haven’t all made it to the point of queer liberation. That not all communities who participate in Pride are actually able to be free in that celebration,” Williams said ahead of the parade. But does that mean that freedom cannot be celebrated at all when others fight for their freedom? Maybe we can use that opportunity of freedom to put a spotlight on those who are in need and those who are still fighting. Freedom is not something that comes free. When we stop fighting for it we lose it. But we cannot forget, we may not forget that it is not done. It is never done. There will always be groups with good intentions that collide. Maybe we can learn to listen well and to integrate different calls for help and calls for action in the spotlight instead of fighting for the spotlight. There are so many things that demand our attention and time. Let's make the best of our time....together.